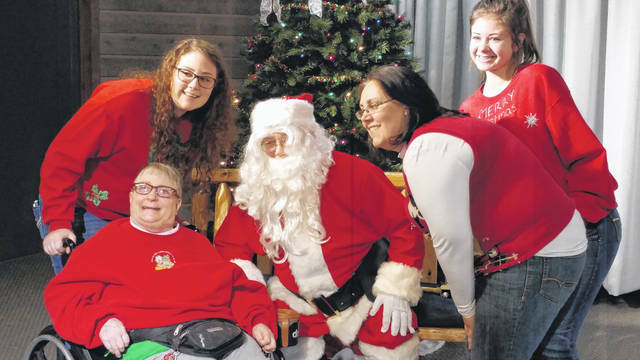 During the 2017 Recreation Unlimited Foundation Holiday Camper Party, young and old lined up for a chance to visit with Santa. Excitement filled the air as Santa Claus made his grand entrance to this year’s Recreation Unlimited Foundation annual Camper Holiday Party. He said the annual party is always held the first Saturday of December. Huttlin said after visiting with the jolly old elf, campers received a goodie bag and then got into a line at the gift table to choose their special present. Huttlin said the organization, a not-for-profit, serves over 3,200 campers with disabilities and health concerns annually through Summer and Autumn Camps, year-round weekend respites, and a week-long Prader-Willi Syndrome camp. He said it’s also a place for families to get a “respite” from the demands of caring for a special needs family member. Huttlin said Director Melissa Brown of the Enchanted Care Learning Centers of Ohio asked parents to purchase and donate a gift for both a child and adult. He said the center collected over 280 gifts for the holiday party. According to Huttlin, Paula Laird with the Westerville Alumni Golf and Friends Committee donated dozens of baked goods. Regina Jones of Jones Potato Chip Company donated the chips. Don Boger from Rightway Food Service donated lots of hot dogs to feed the crowd. Huttlin said the entertainment not only included the appearance of Santa Claus, but also Joe House, choral director at River Valley High School, who sang and conducted sing-a-longs, and four crazy, magicians/clowns — Rufus, Jingles, Whistles, and Bumbles — who performed fun magic tricks. “Recreation Unlimited is a place where no one has a disability and all are equal,” Huttlin said. Recreation Unlimited is a 501(c)3 not-for-profit organization located at 7700 Piper Road, Ashley.